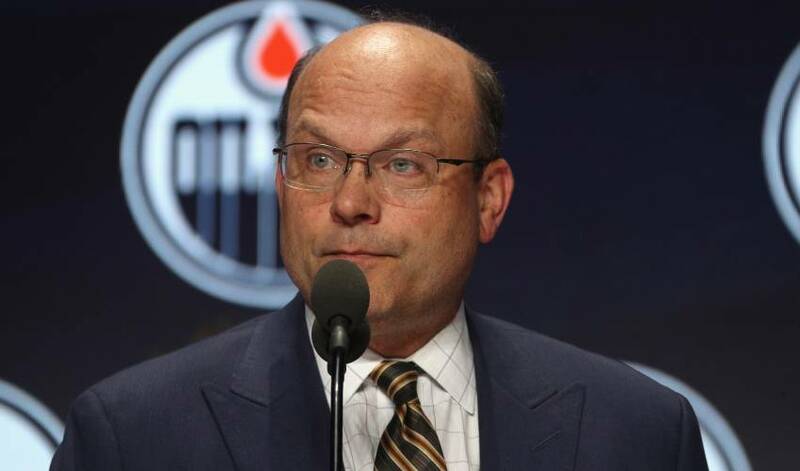 EDMONTON — The CEO of the Edmonton Oilers says the firing of general manager Peter Chiarelli has him looking to root out larger problems in an organization that has missed the playoffs in 11 of the last 12 NHL seasons. "We've got some real good players. We've got some real good staff. But there's something in the water here in Edmonton that we don't have right, and we've got to get that figured out," Bob Nicholson told reporters Wednesday as the team formally announced Chiarelli's departure as GM and president of hockey operations. "The way that you figure that out is you talk to people. I'm going to try to open up more doors in all aspects of this organization to find out those little things that just haven't been fixed over the last number of years for us not to be in the playoffs." Nicholson said Chiarelli was told he was out after the second period of the Oilers' 3-2 loss at home to the Detroit Red Wings on Tuesday night, although Nicholson said the decision was made earlier than that. Edmonton enters the all-star break one game under .500 at 23-24-3 and doesn't play again until Feb. 2. The Oilers are in danger of missing the playoffs for the second straight season and third time in four years under Chiarelli. The Oilers have won just one playoff series since reaching the Stanley Cup final in 2006. In the past 10 years, the organization has had eight head coaches and three GMs. This was a year the Oilers were expected to rebound back to the playoff form of two seasons ago. Nicholson was asked about Chiarelli's reaction to the news. "He was very professional about it," said Nicholson. "He was disappointed. "He really felt that he had let the organization down in not having this team in the playoffs. And I think any time (a firing) happens a person is shocked but I really feel that he knew there was a lot of chatter so it wasn't a huge surprise to him." In recent days, local bloggers and columnists had been calling for Chiarelli to be fired and some fans at the Wings game chanted "Fire Chiarelli!" The Oilers fired head coach Todd McLellan in November and replaced him with Ken Hitchcock. Nicholson said Hitchcock's duties won't change and that assistant general manager Keith Gretzky will inherit many of Chiarelli's duties as the search begins for a new GM. Nicholson is in charge of hockey operations. Nicholson stressed that the firing does not signal the season is lost, that the team is launching a full-scale rebuild, or that the Oilers will pull the trigger on a panic trade for short-term benefit. "We're going to put all of the onus on the group inside the dressing room because they have shown that they can do it," he said. "We will look to try to bolster the offence and the defence, but we're not trading away our first-(round draft) pick. When you look at some of our other top prospects, we're not giving them away unless we get some real good pieces back." Chiarelli was originally hired to rebuild the Oilers around superstar Connor McDavid in April of 2015, but has struggled to find the right pieces to play alongside the reigning Art Ross Trophy winner. Many fans have never forgiven him for trading star forward Taylor Hall in 2016 for struggling defenceman Adam Larsson. He also traded away dependable scorer Jordan Eberle for what ultimately became Ryan Spooner, who was put on waivers this week. He has also inked underperforming forward Milan Lucic to a multi-year millstone contract at US$6 million per season. Chiarelli's last move as GM was signing goaltender Mikko Koskinen to a three-year contract extension earlier this week, with an average annual salary of US$4.5 million, despite the netminder being 30 years old and having only 27 games with Edmonton. Nicholson said the move to sign Koskinen was a group decision. Chiarelli, a native of Nepean, Ont., was fired by the Boston Bruins in April 2015. Boston won the Stanley Cup in 2011 with Chiarelli as GM.